Fat is important in many contexts; however, among vertebrates, migratory birds have clearly mastered fat metabolism to fuel exercise. Flight requires an exercise intensity of about ten times the basal metabolic rate, and some migrant birds maintain continuous flight for as long as a week or more without food, water or rest. Fat is the only metabolic fuel substrate with sufficient energy yield per unit wet mass to allow birds to store enough energy to accomplish these feats of endurance. The problem with fat as a metabolic fuel is that its low solubility severely limits transport rate, and most vertebrates have very limited ability to metabolise fats at a high rate for exercise. Migratory birds have solved this problem by investing heavily in protein mediated fatty acid transport pathways, which are upregulated during migratory seasons and during endurance flight itself. The quality of fat may also be important for migration, and particular monounsaturated and polyunsaturated fatty acids have been proposed to influence migration performance. Long-distance migratory bats face similar metabolic challenges to birds, but having evolved self-powered flight independently, bats offer an interesting comparison to birds. I will review existing information as well as present new transcriptomic and experimental results regarding the metabolic adaptations of migratory birds and bats. 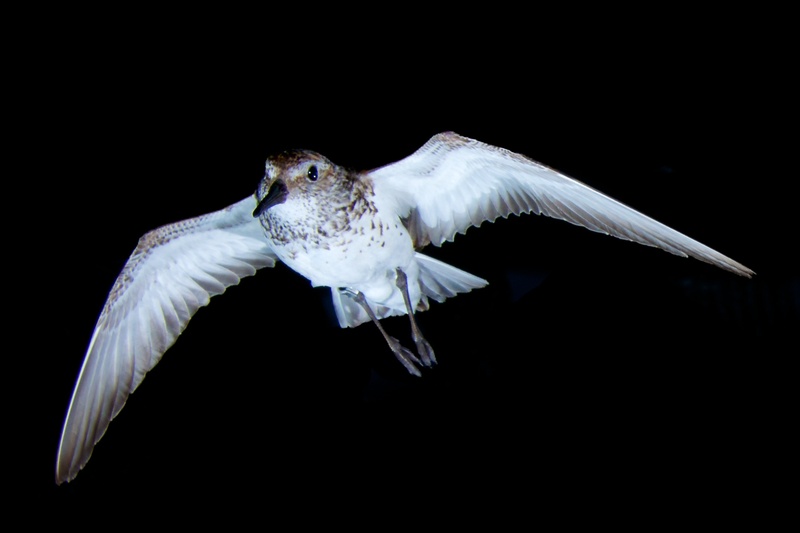 A western sandpiper flying in the AFAR wind tunnel. Photo credit: B. Fenton.